Now Kay is a very careful and thorough researcher, so she knows that there’s more to this question than just what the law says. As Elizabeth Shown Mills teaches, “Sources give us information from which we select evidence for analysis. A sound conclusion may be considered proof.”3 In this case, as in most cases, the law is just one source, along with the census records, the records showing families with this name and the other records Kay has found. The contents of those sources provide information (that some permission was required, that there was a female of the right age in his 1840 household), and Kay has selected facts from the entirety to focus on as evidence. The last step is the sound conclusion. And it’s that last step that usually gives me running fits. I always have to ask myself: have I looked at all the sources that might reasonably suggest an answer here? The Genealogical Proof Standard requires us to conduct “a reasonably exhaustive search” of the records before we reach a conclusion.4 In this particular case, I’d want to look at a few things more to feel comfortable in reasonably ruling out the possibility that the female in 1840 could have been niece (or other collateral relative), not daughter. I’d want to know try to find this family in 1830 to see whether there were other families with that surname in THAT area. I’d want to look at the court records there and in Schuyler County to see if there was any indication of a death in another family that could have put a female child into this family. I’d try to find obituaries of the father and any other known children of the father to see if this woman was listed as a daughter or sister. I’d look for probate records for the father and other known children to check for any evidence of a relationship. Kay’s going to be at Rootstech in Salt Lake City early next month and had already scheduled extra time at the Family History Library to look for the answers to these questions long before she asked about the statute. I can’t wait to hear what she finds. Judy – thanks so much for this presentation of my problem! I’ll be reporting back to you after RootsTech. I am enjoying your blog so much – so glad you decided to share your legal knowledge with our community. Thanks so much for a great question, Kay! Looking forward to seeing what you find out!! Step by step by step by step … I love to leap, myself, to those probably-possibly-could-be-hoped-for conclusions. Teaching beginners is definitely making me be much more thorough & careful – a great side-benefit. One day, more courses! Cheers on another great helpful post. Examples do not prove the rule, but I’ve seen cases in Illinois during this same time period where the couple who gave permission for “our daughter” to marry in 1868 were actually the mother and step-father of the bride. The bride was listed with the same last name as the step-father on the marriage record and the step-father was NOT her guardian (her mother was her appointed guardian). She’s also listed with the step-father’s last name in the 1860 census. The same last name and the giving of permission would reasonably indicate a relationship and it’s probably the case that he was the father, but (in the absence of other details) it’s always possible the biological father was deceased and this man is an uncle or older brother. That’s the bottom line here — getting all the details through a reasonably exhaustive search! I need help ik of a 16 year old who wants to marry a 30 year old in illinois and parents consent to it. Can they get married? 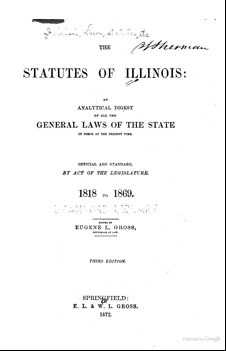 If you’re looking at a historical record, you need to consult the laws of the time and place, and Illinois statutes can be found in a wonderful guide from Chicago genealogist Debbie Mieszala at The Advancing Genealogist (http://advancinggenealogist.com/resources/historic-illinois-statutes/). If you’re asking about a current marriage, Illinois statutes are on the Illinois legislature website (http://www.ilga.gov/legislation/ilcs/ilcs.asp).